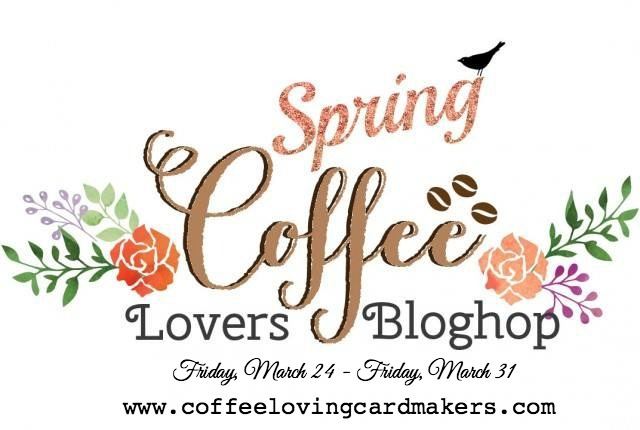 Hi Friends: It's time for the 2017 Spring Coffee Lovers Blog Hop. 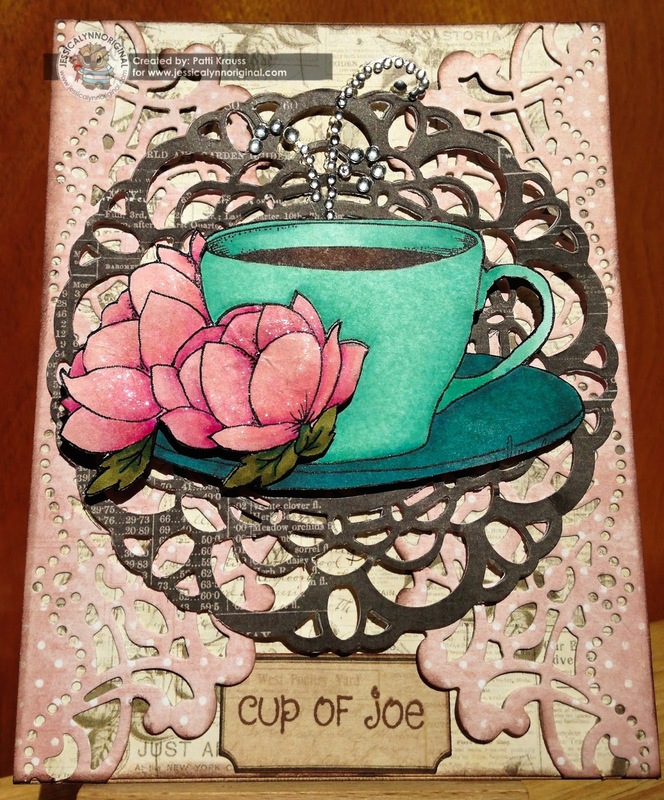 I am using the new digital stamp called, you guessed it, 2017 Spring Coffee Lovers Blog Hop Digital Rubber Stamp from JessicaLynnOriginal stamps. This stamp is currently free for you to download and use during the Blog Hop, which runs from March 24-31, 2017. I had a lot of fun with this one - using this great digi from JessicaLynnOriginal.com and some new dies from Crafter's Companion - always fun to play with new toys! Come play with us on the blog hop and visit all of my design teammates and see what else they've done with this fun stamp set, and other digis from Jessica. Don't forget, if you decide to purchase any stamps or digis from the store, please remember to put my name in the instructions/comments section during checkout. Print 2 copies of the image onto smooth white cardstock and color with Spectrum Noir markers. Fussy cut the full cup image from 1, then fussy cut the flowers from the other image. Shape the flowers with the flower shaping tools, then use foam squares to pop them up over the flowers on the cup. Using the Something Blue papers, cut background paper to fit A2 card base, ink edges. Use Sophia die to cut 2 edge panels from pink coordinating paper, and Doily die to cut doily from dark brown paper, ink edges, and layer these over the card base, Use foam squares to pop the coffee cup in the center for more dimension. Add glitter brush pen to the flowers. Stamp sentiment onto coordinating paper using brown ink, cut with ticket punch, ink edges, and add to card. Finish with a flourish of gems for the steam from the coffee. So pretty! Love this! Hugs! Really pretty, love how the blooms turned out. Really beautiful. This cup and saucer deserves a lovely doily. Gorgeous card & fabulous layers. So pretty, love the doily's you added. Wonderful coloring of that pretty image and I love how you layered it onto those pretty dies cuts. Your colouring is beautiful and the card is really awesome. Patti! This is so beautiful! I always love your card designs and it's colored so beautifully! What a lovely card! I love the color combo you've used! Superb! Such lovely colors and fabulous layers! Great coloring on this beauty!